Here's another pretty Crown. 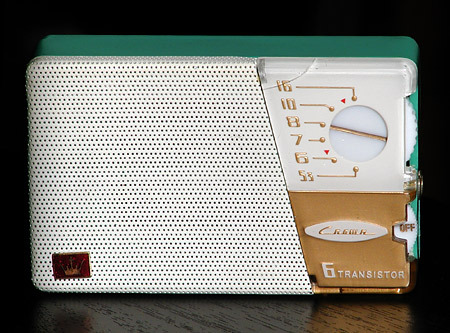 The 6-transistor TR-666 is a chubby little horizontal shirt-pocket radio. I don't have specific documentation on it, but my guess is that the model began shipping sometime in the second half of 1958. I think the picture tells the story of this model. It's a pretty blend of colours, reverse-painted plastic and a speaker grille that is painted white. The radio pictured here has seen some hard times and there are a couple of hairlines in the reverse-painted escutcheon. On the other hand, it doesn't display the wear in the gold paint above the Crown name found on many samples of this model caused by a piece of tape originally stuck on the inside. To date I've seen the TR-666 in red, black, white and the turquoise (or sea foam green or whatever it is) you see here. Bob Davidson informs me that he's also seen the model in powder (or baby) blue and in grey, bringing us to a whopping total of six colours. Could there still be others out there you'd like to add to the list?